The proposed project involves the construction of a 15 kilometer Super Bridge, two (2) or four (4) lanes with an optional pedestrian/bicycle lane, which will link Mindoro Island to the Province of Batangas. 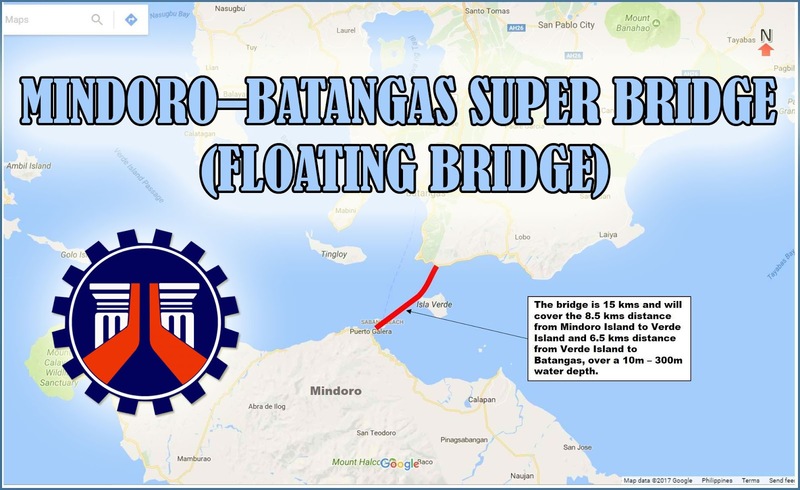 The bridge will cover the 8.5 km from Mindoro Island to Verde Island and 6.5 km from Verde Island to Batangas, over a 10m – 300m water depth. maximize the current position of Mindoro Island as “Luzon's Gateway to the South” to the Island Provinces of Visayas and Mindanao Region through opening roads to faster and efficient transport of goods and people along the existing Nautical Highway. cater to the increasing demand for expansion and optimization of basic industries or utilities like water, power, oil, and telecommunication companies. DPWH awaits for the Provincial Resolution pursuing the project under PPP mode as discussed during the May 25, 2018 meeting with Governor Umali.